2006 SSQQ SLOW DANCE AND ROMANCE! 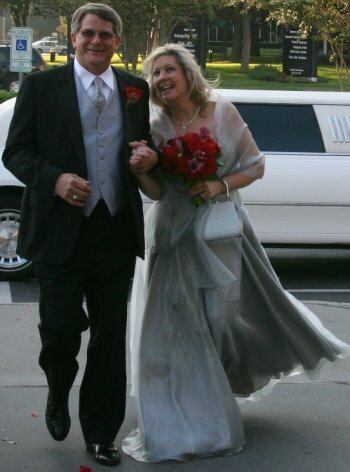 November 2006 - Carol Gafford and Rick Mullet get Married! 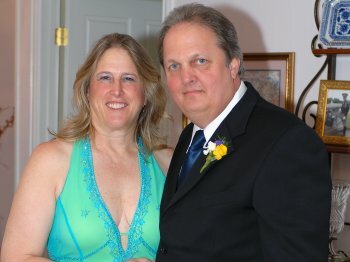 On Saturday, November 4, long-time sweethearts Rick Mullet and Carol Gafford were married in a ceremony held at the home of their friends Tom and Margaret Easley. All four people are very close friends of mine, so I will speak candidly - this was a wedding I've been waiting for a long time! As the legend goes, Carol was at Midnight Rodeo one night around 1993 with her friends Tom and Margaret. That is when Rick's twin brother Nick dropped over to introduce his brother Rick to Tom, Margaret, and Carol. Carol took one look at Rick and told him he ought to cut his ponytail. Rick disappeared shortly after. A few months later, Tom threw one his famous water volleyball parties. He invited Nick and Rick over to play. I was there too. That was when I first met Rick and Nick. I didn't like them much at first. I was mad because my team kept losing to them all day long! Carol was there too. Although she never plays, she provides a marvelous poolside distraction in her bathing suit. I never can decide which side she should sit on - would I rather watch her or gain a real edge on the other team by making them watch her? Well, apparently when the Rick and Carol saw each other in their bathing suits, sparks began to fly. Suddenly that ponytail and that smart mouth didn't seem quite as big an obstacle any more. Rick and Carol starting going together soon after.... and going together... and going together... somewhere along there the story changed to being engaged... and being engaged... and being engaged. One day I teased them about the longest engagement in history. That's when they told me 'they just wanted to be sure'. 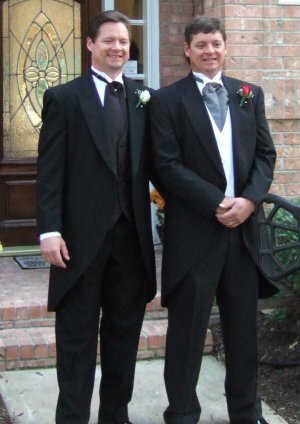 That day was about five years ago. 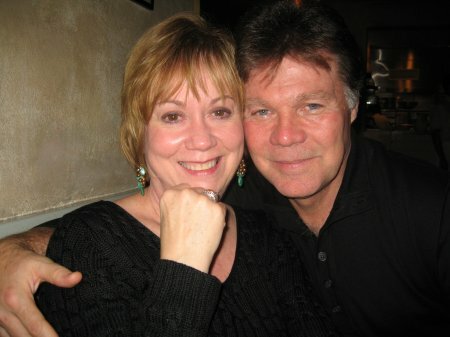 In all, Rick and Carol have been together now for thirteen years! Along the way, I have discovered that my former water volleyball opponents are two of the nicest guys in the world. These two brothers are great friends to have. Which is why I am thrilled that Carol and Rick finally got married - they are so great together! This is the first marriage for both Rick and Carol. I wish them all the luck in the world. They are my wonderful friends and I am really happy for them. 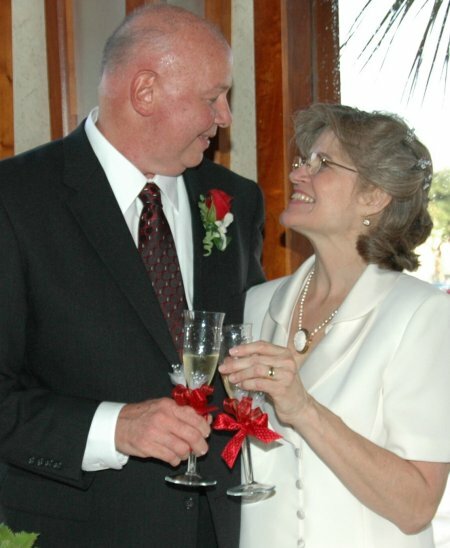 October 2006 - Larry Thomas and Pam Cochran get Married! Rick, its official. 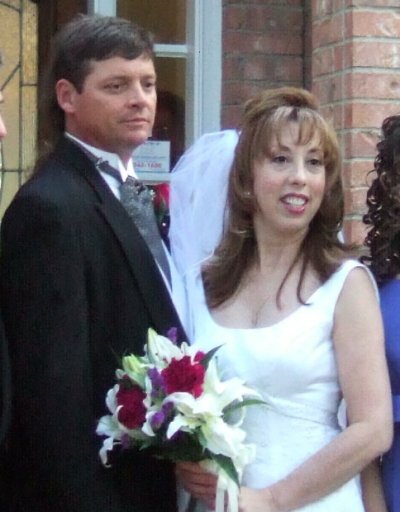 Larry & Pam were married on October 8, 2006! All the kids were there! 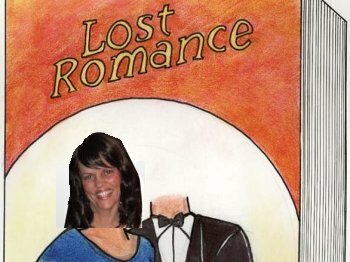 Thanks for another successful SSQQ Romance. It all began in your beginning two-step class. We are now Larry & Pam Thomas. 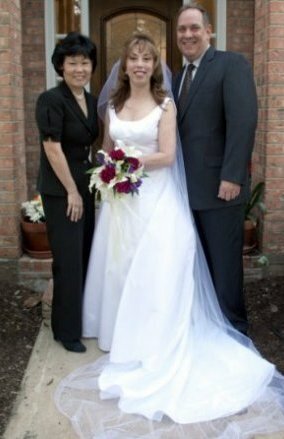 September 2006 - Chuck Snyder and Dena Jackson get Married! Hey Rick, As I was reading your latest newsletter, I realized I told you about our engagement, but never reported back on our wedding. Gotta keep the SSQQ Romance stats up! Chuck and I met in Ben's Beginning Two Step class in February 2002, and he was the first guy to ask me to dance when Ben told us to partner up. We were friends for several months before we started dating that May. 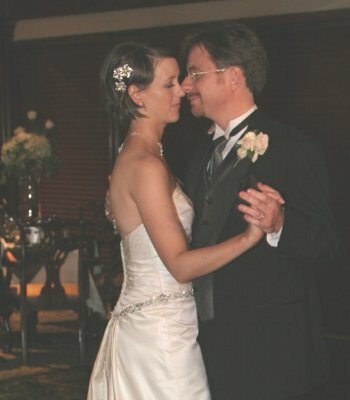 We were married on September 30, 2006. 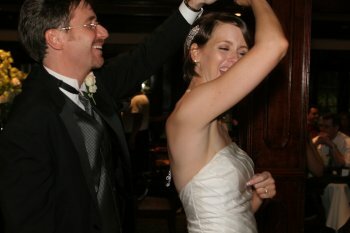 Here are a few pictures from our wedding and first dance. 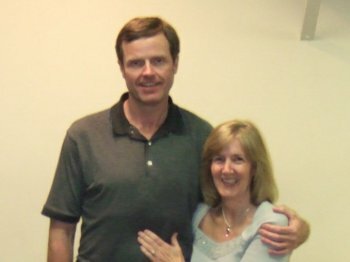 Evidently Ben's class was a big hit - there was another marriage that also originated there (Philip Ritchie and Kathy Fink). And, by the way, my advice to anyone who complains about not having a special someone is always... go to SSQQ! We plan to brush up on our dancing skills this year, and hope to see you at the studio soon! 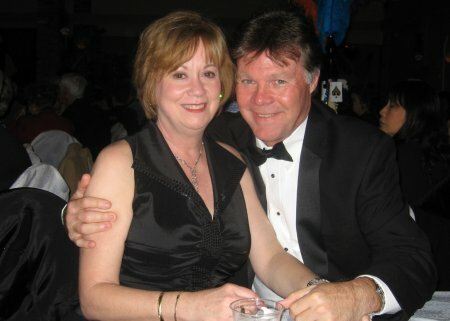 Rick Archer's Note: Chuck and Dena met in February 2002, then joined us for the August 2002 Rhapsody Cruise. But that was the last time I saw them. As you can see, their courtship covered 4 years (2002-2006). Since the final three years of their courtship took place away from the studio, I would never have known their complete story if Dena had been not kind enough to check in 2 1/2 years later to report about their wedding . I call this phenomenon "Flying Under the Radar" - couples who meet at the studio, then disappear to pursue other activities. 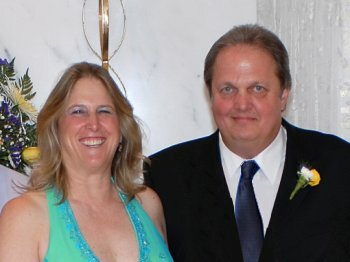 The story of Chuck and Dena is a perfect example why I believe the true wedding totals at SSQQ are probably under-reported by 20%. For every 4 couples I know about, there is a fifth couple that met at the studio and moved on without a trace. Or maybe they reported the engagement, but got busy and forgot to tie up the loose end. This explains why I emphasize including "engagements" in my total just in case I don't hear about the "wedding" further down the road. For example, Chuck and Dena were listed on my site as "engaged", but it took three years to add in this final piece of the puzzle. Since I take so much pride in the studio's uncanny ability to help create matches, it makes me very happy to bring closure to Chuck and Dena's wonderful story. 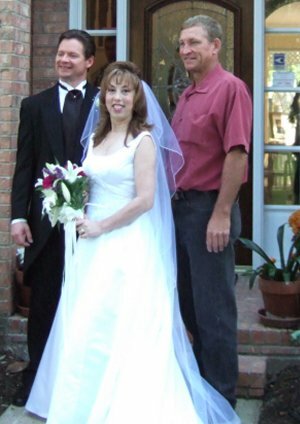 August 2006 - Curtis Goode and Kathy Heller get Married! Rick, I trust this email finds you well. 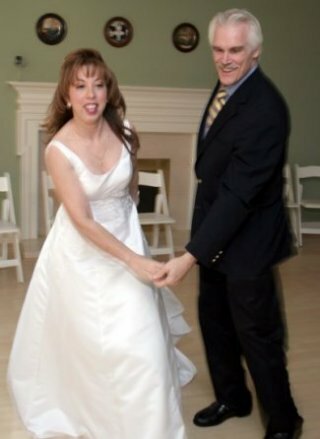 You may remember that Kathy Heller (now Goode) and I were married this past weekend. 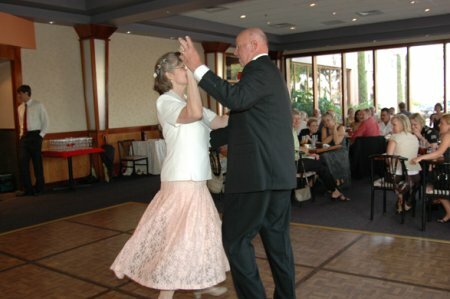 Everything was great, the 'first dance' was a success...thanks to you and the fine instructors at SSQQ. We had people asking about lessons and we quickly recommended 'the' studio. 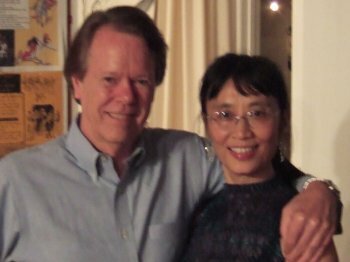 Pretty soon Kathy and I will be ready to get back to learning, having fun and just general good times at SSQQ. 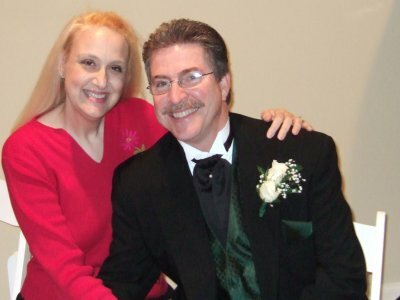 August 2006 - John Otts and Cynthia Hall get Married! 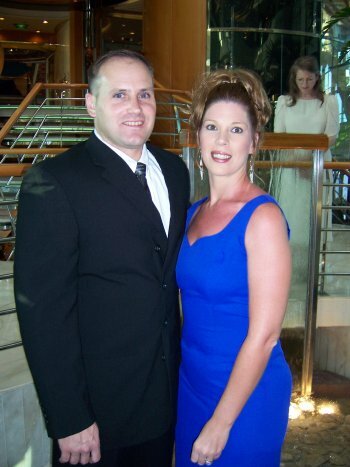 I first met John and Cynthia on the 2005 Rita Rhapsody Cruise. That trip was only 3 days long, so I am sorry to say I barely had time to learn their names, much less get to know them. 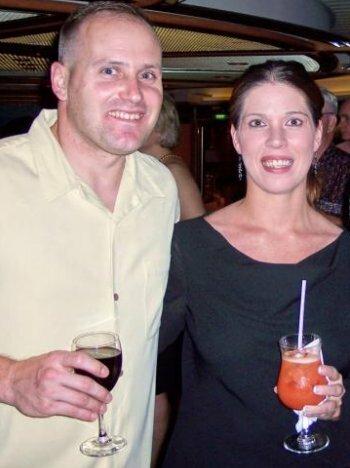 I was told that John and Cynthia were hoping to get married in Cozumel on the 2006 Rhapsody Cruise, but when I saw John on the first day on board the ship, he said that he and Cynthia had already gotten married. This trip would be their Honeymoon. Of course I smiled and congratulated him, but there was clearly something bothering John. I asked what was the matter. John replied that Cynthia was so sick she couldn't even leave her cabin! He was worried out of his mind. I felt so sorry for both of them! It was not until Monday that we finally saw Cynthia. She made her first appearance in that stunning blue dress. You could not ask for a more beautiful bride. 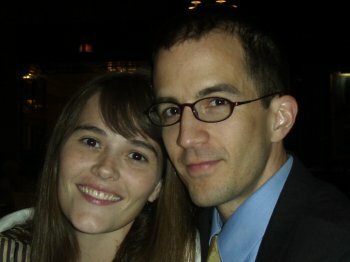 June 2006 - John Moniz and Shey Tekulve get Married! On Saturday, June 17, John Moniz and Shey Tekulve were married in a small ceremony held at John's home. 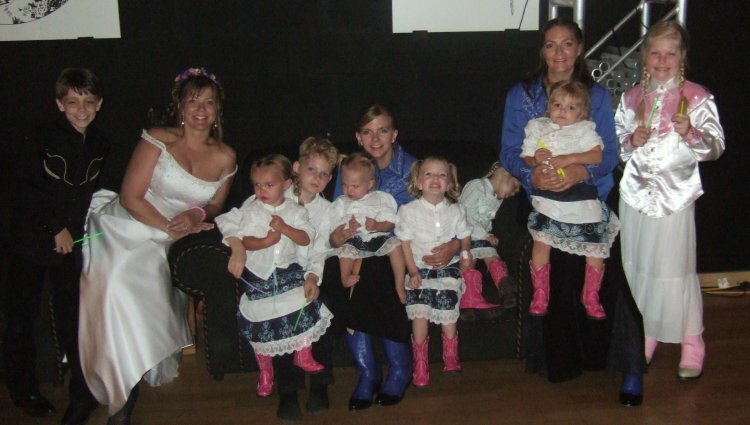 At the wedding were his parents, five brothers and sisters, and several nieces and nephews. Representing Shey's side of the family were her mother, her children, her two sisters, and a string of 7 look-a-like nieces. For a moment, I thought we had the Von Trapp Family in "Sound of Music" here at the wedding! 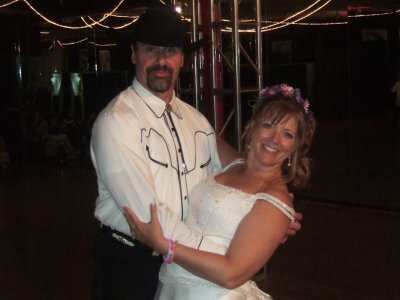 John and Shey met in Sharon Crawford Shaw's Western Waltz class a couple years back. Because dancing was how they met and a big part of their courtship, John and Shey decided to take their Wedding Dance seriously. They took several Tango lessons in preparation for their Wedding dance. Their preparation paid off - they looked like professionals out on the floor. To my surprise, they also danced a Western Waltz as well. 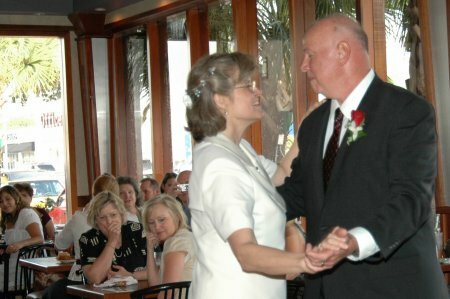 I have never seen a couple perform two Wedding dances before! Naturally the guests were awe-struck. John and Shey put on quite a show! 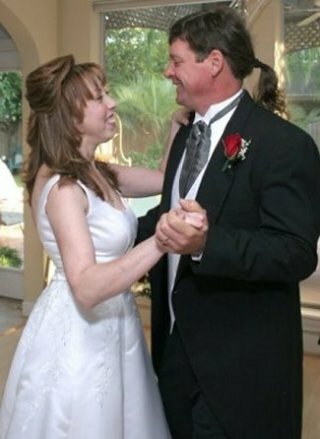 May 2006 - Barbara St. Lawrence and Kent Carson get Married! 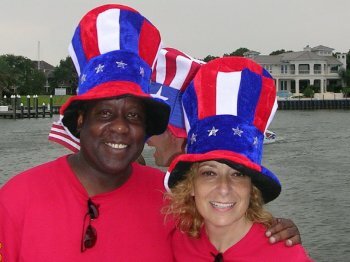 May 2006 - Sorrell Warren and Penney Godwin get Married! I am happy to announce another engagement that SSQQ can take full credit for. Sorrell Warren and I are engaged and will be married on May 20, 2006, in Galveston. We started dating right after the party and as they say, the rest is history. 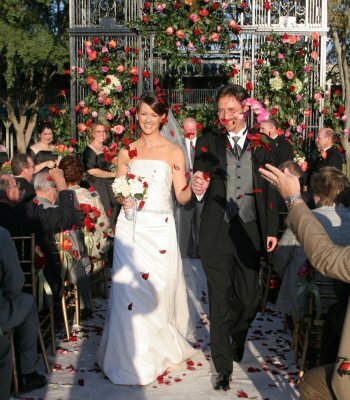 May 2006 - Gonzalo Manuel and Claudia Guererro get Married! Gonzalo and Claudia were married yesterday (May 21) with just the immediate family at the ministers house. They will have another in November for their many friends and family. It was lovely and they will celebrate their anniversary on both dates. 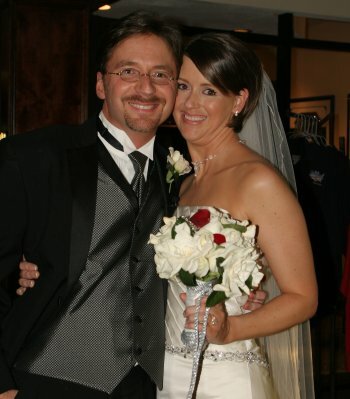 March 2006 - Wil Uecker and Karen Fess get Married! Please add one of my favorite couples to the legendary list of SSQQ Slow Dance and Romance. They never cease to amaze me. 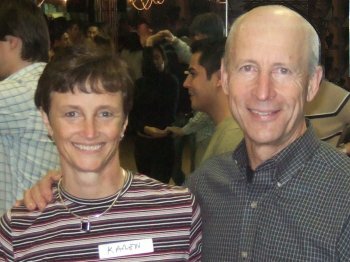 About two weeks ago as I was putting the finishing touches on my Matchmaker Story, I mentioned this Wil and Karen in Chapter 6 as an example of a couple that didn't meet at SSQQ (they met through match.com), but spent most of their courtship here. I said that if SSQQ was a big part in sealing the deal, I would claim them. And claim them I did! I discovered they were at the studio two or three nights a week for practically their entire courtship! If you read my article, you see that I was astounded to discover they had taken 20 dance classes together in less than a year. So just teasing around, I decided maybe it was about time to offer them a free lesson as a 'thank you' for being such great customers. So on Thursday, March 23, 2006, I made an effort to type up a gift certificate for them since I knew they would be in dance class that night. They were a little late getting to class, but I was so pleased to see them I rushed over to hand them my gift certificate. They smiled and said, "Gee, thanks!" Judging by the blank looks on their faces, they did not seem to know why I was doing this. I had a hunch they did not know that I had written a story about them. It didn't matter because it was the thought that counts and I was really happy to reward them. Then in the middle of class a few minutes later one of my students said, "Hey Rick, did you know that Wil and Karen got married today?" I was stupefied. No kidding? It had only been a month since they told me they were engaged! These guys don't mess around! But what was most amazing was they were here for dance class on the first night of their marriage!! What an honor to be made a part of their Wedding Day!! I asked Karen about the Wedding. She said it was super fun and gave her a chance to see all of her family. Karen said it was especially rewarding to see how much her children liked Wil. In fact, it was their respect for them that made her realize just how special a man he is. With that, I knew this couple was perfect for each other. What a marvelous thing to say. Not only did I grin from ear to ear all night long, I had a field day with jokes. For example, I asked the class if anyone was getting married soon. Where there any another announcements? I made eye contact with several couples who had met at the studio and were dating. They recoiled from my gaze in fear! Another time I told Wil to dance with Karen an extra time during rotation. One of the guys quipped, "Why don't they have to switch?" I asked him if he had gotten married that day. When he said he hadn't, I replied, "Well, let me know when you get married and I won't make you switch for the entire class." I also told the class from now on I expected the SAME COMMITMENT to dance class that Wil and Karen had. I said I didn't care if they broke a leg, had a flat tire, or had Astros World Series tickets, I expected them in dance class anyway. Let Wil and Karen be your example! Everyone then gave our Wedding Couple the obligatory dirty looks for making the rest of the class seem like goof-offs by comparison. Quite frankly, no matter how extensive our history of romances has been, we have never been graced with a couple spending their Honeymoon at the studio before. Yes, I had a lot of fun in that dance class that night thanks to Wil and Karen. I am so happy for both of them! 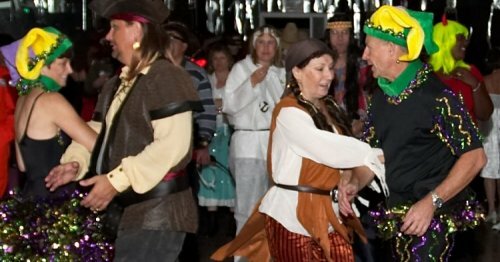 One more thing - Wil and Karen are just the latest examples of an important SSQQ rule - be careful what you wear to the Halloween Party; your picture might just turn up in your SSQQ wedding album. 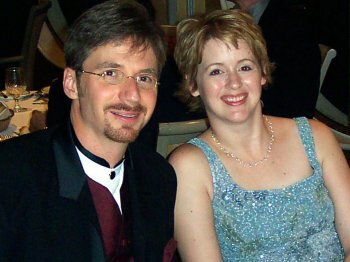 March 2006 - Erica Keast and David Heroy get Married! David and I met at SSQQ back in September 2003. 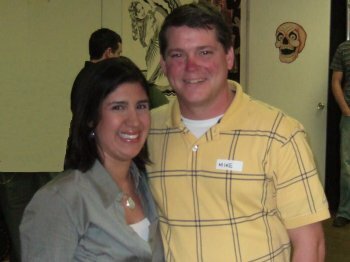 We got engaged in March 2005 and we are getting married in March 2006. 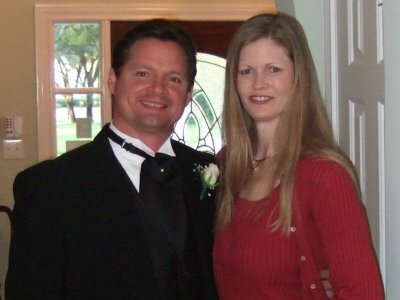 January 2006 - John Sartain and Becky Stinson get Married! I was doing an article on my matchmaking duties at the studio and realized I had not followed up on your engagement story from a year ago. How are you and Becky getting along? (Hint hint). Hope you are well! It's good to hear from you. 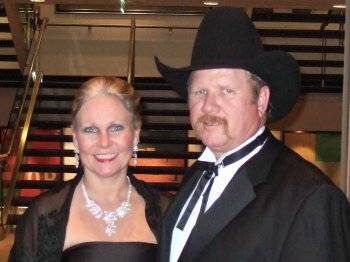 We've been really busy over the last six months or so and haven't gotten back to dancing class although we still go every now and then over to Wild West. We got married in January and it's been great. 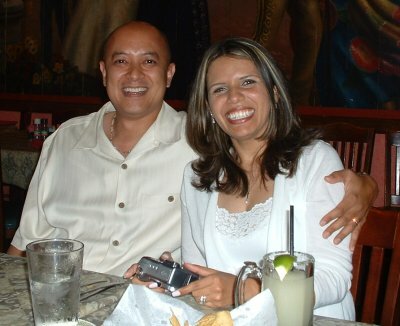 We took a short honeymoon to Las Vegas and had a great time accept we came back a little lighter in the pocket book. Anyway, we've been talking about getting back to SSQQ and we probably will sometime in the near future. Hope all is well and we'll see you soon. I am so happy for both of you!! Sorry Vegas wasn't more cooperative, but I am sure you had a great time! 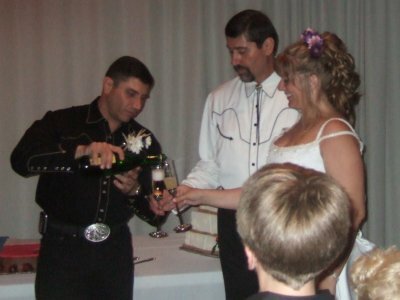 One more thing� Maybe you could email me a couple pictures from the wedding? 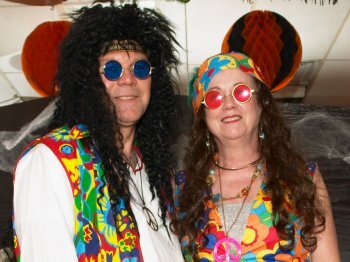 Otherwise our Romance page is going to be stuck with your amazing hippie outfits from Halloween 2004!! Noticed you had suggested Becky & John send you a replacement pic for their Wedding Page. Not that their Halloween photo shouldn't remain in place; that one is purely a classic! 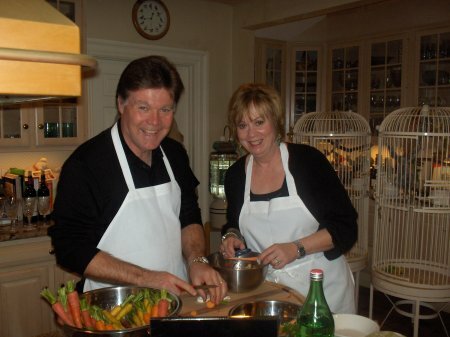 I've attached a few recent pics -- maybe a bit more recognizable as Becky & John.